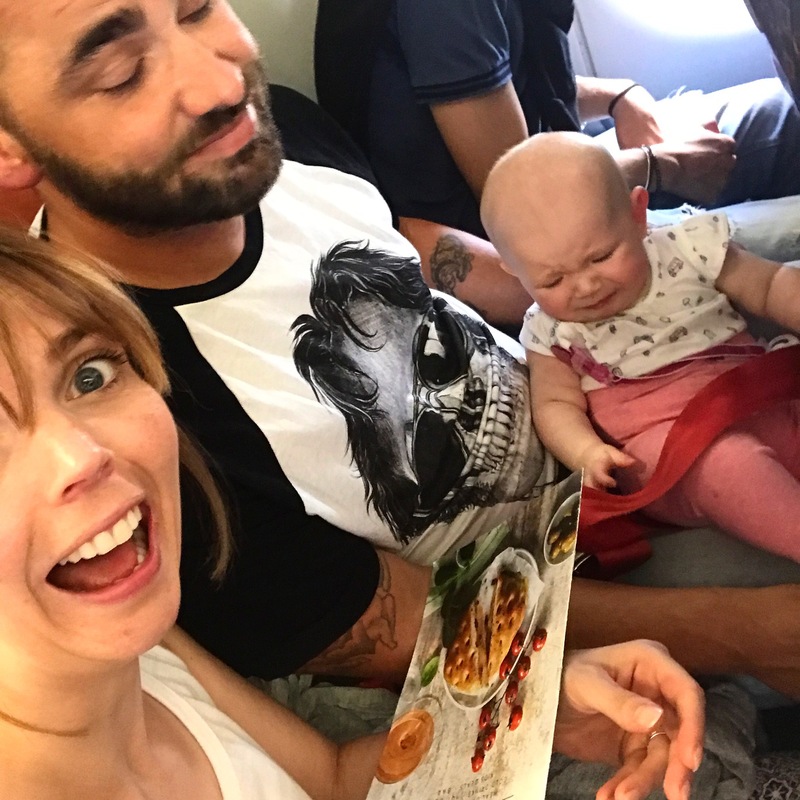 How to survive your first flight with a baby! Starting off gently (no 13 hours flight to Singapore just yet!) 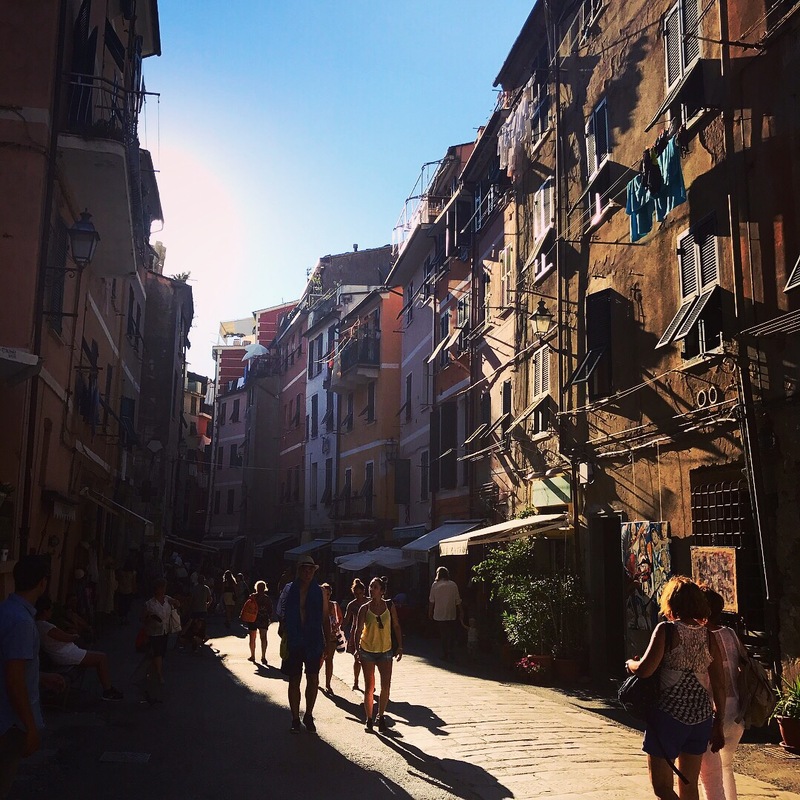 we opted to fly to Italy. We love the country, it’s beautiful, the food is incredible, friendly and no too far for our first flight. We also had a friends wedding so thought we could kill two birds with one stone. 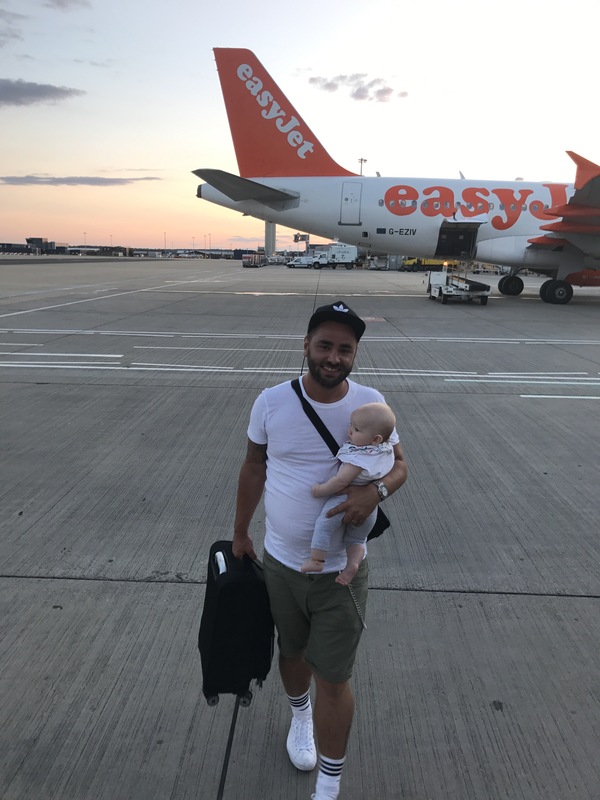 We chose to fly with Easyjet not just because we are frequent fliers with them pre baby, but because the flight went to Pisa our base for the trip. 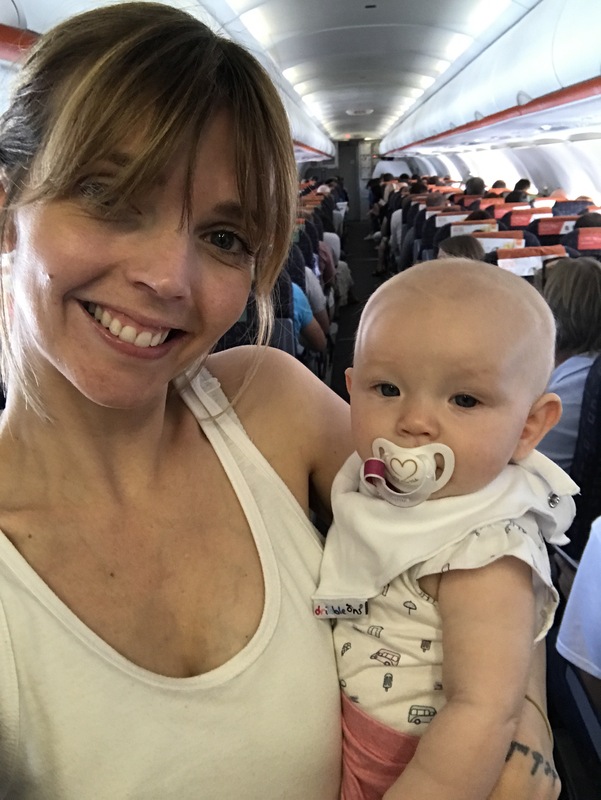 Being August one of the peak months to fly, we headed to the airport slightly earlier to allow time for security, food and all things baby if needed – feeds, poo explosions, you know the score! In a nut shell we had two very different experiences on the flight out and inbound. So what is the worst that can happen? Screaming, uncontrollable child for the whole flight that was delayed, came with poo explosions and dirty looks from all directions. Yes. This was our flight to Italy. On the way back, we had a sleepy and giggly baby that was happy to smile at every passing passenger and I even managed to watch half of the movie bridesmaids! Result! After surviving my first flight, here are 10 tips to help you if you decide to go – which I highly recommend and encourage! Babies can be very unpredictable. Who is saying they won’t projectile vomit, be happy, be sad, struggle with their ears or decide to sleep for the entire flight (we can wish!). So pack your bag carefully. I had a rucksack type changing bag from Amazon by Bebemour. It’s fab and has loads of sections to pack everything you need for both you and baby. Think about changing mat, calpol, dummies etc – I will blog about essential travel items soon. Obviously this can be impossible if you have to travel alone for whatever reason. If that’s the case, just bear in mind there are some incredibly supportive people out there that I’m sure will be in your flight. We had people asking to hold her, smiling, general distracting which is all helpful. If you can, take someone! I traveled with my husband and it helped to pass the baby when one needed the loo or carry a bag etc. It makes flying much easier! A little extreme but on our flight home someone projectile vomited down the aisle. With no windows, I had to just breathe through my mouth and sit tight till we landed. That flying tube is FULL of nasty germs and with people sneezing, coughing and not washing their hands I defo don’t take risks even more so with the bubba in tow. I packed sanitising gel, wipes and ensured that prescious dummy was well attached to the little one. This tip is a precaution rather than having a sick bubba whilst you are away. Many planes crank up the A.C once you are airborne and the plane turns into a flying fridge. I definitely feel the cold so the baby is too. Layers and a change of clothes are a good idea with a thin blanket to keep snug if it becomes cool. Layers to peel off if you are like us and sit on the runway delayed for an hour sweating! Don’t forget those socks or babygrows to keep those tootsies warm! Flying with easyjet meant that we were entitled to 2 extra items to check in plus a changing bag in the flight. We opted for the car seat (as we were hiring a car) and a stroller (with an ergo baby stuffed underneath!). The car seat was checked in and the stroller used around the airport and dropped at the gate – very handy! Check this useful guide by Sky Scanner that shows all the airlines and luggage for babies. A good tool! Sounds obvious but we didn’t book a 6am flight. This would mean getting up at silly o’clock to drive there, check in etc and would result in super tired parents as well as a potentially grouchy baby. Bad combo. If there is a particular time that your little one turns into a little devil, avoid that time. Some say witching hour is around 6-9pm so if that’s the case for you, avoid. Babies and small children have much smaller ear canals and do not know what to do if their ears pop on take off or landing. Swallowing is an easy way to pop ears back to normal so encourage this by feeding or using a dummy particularly when the flight is going up or down. This made a huge difference to us and I didn’t notice any discomfort from my little one. Another tricky one is if your baby has a cold. Flying is very uncomfortable for an adult when stuffy and can result in painful ears so just to bear in mind on your next flight. Your baby is likely to be afraid or require more comfort than usual so don’t forget that favourite toy or comforter. We took her favourite Lamaze firefly toy as she can spend long periods playing, chewing and looking at it. I also downloaded a baby app on my phone called Baby View that is just high contrast images of ladybirds and butterflies that she is mesmerised by. Very handy when she decided that she wanted to scream and throw a tantrum before take off! Very useful! Just use anything! We even resorted to the inflight magazine that she found highly interesting!